Three years ago this June at age 28, I was shockingly diagnosed with breast cancer. From that moment, I was determined to beat this both physically and emotionally. I was always a positive person. I knew this would be an uphill battle but would not let the grueling treatment process make me a bitter person, because then cancer would have won even if I had eradicated the disease. I wanted to look to the future when I would be myself again. My husband and I had been married for 2 years and had a 6 month old son. The diagnosis brought up the question of infertility. We had hopes of expanding our family in the future. While choosing a cancer treatment plan, I harvested my eggs to ensure the possibility of more children. I needed to keep life as normal as possible and just be myself. In moments of good health, I took every opportunity to play with my son, invite guests for Shabbat meals, and relax at the beach. However, I knew that I could not do this alone. I wanted my friends and family in L.A. around me to celebrate the good times in life. I needed them to support me through the trying times as well. I knew that my community was an integral part of this journey, but I didn’t realize how powerful it would be until I saw the response to my cousin running the NYC 5K SCHLEP sponsored by American Friends of Rabin Medical Center. In ten days she had a big team of runners and raised over $36,000 for the breast cancer screening and prevention program at Israel’s Rabin Medical Center. The runners’ generosity gave me a huge boost to undergo my first chemotherapy treatment. I had a circle of family, friends, and even strangers fighting along with me, which made a grueling 18 months of chemo treatment, radiation, and multiple surgeries more bearable. After my treatment ended, my husband and I decided to bring new life into our family. Through the generosity of an amazing surrogate, we were blessed with two beautiful babies just 10 months ago. As this year’s CHERYL DIAMOND NYC 5K SCHLEP approaches on Sunday, June 22, we decided that this would be THE year to run the race together with our amazing three children. Three years ago I was not able to run the race myself, but had an incredible team of friends who ran for me. Thank God, I am feeling great and will prove that I can do it all on my own this year. 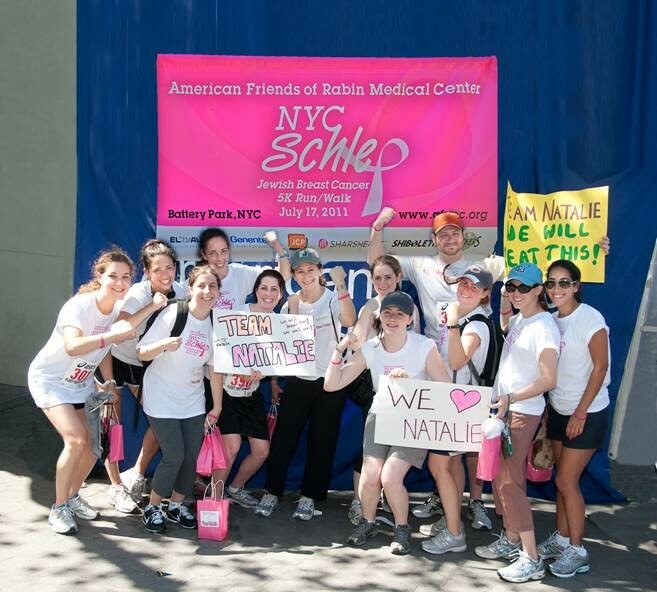 American Friends of Rabin Medical Center will be hosting the Fourth Annual Cheryl Diamond NYC 5k Schlep Run/Walk on Sunday, June 22, 9am (rain or shine) at Robert F. Wagner Jr. Park at Battery Place, NYC. To participate in or donate, click here. Cancer survivors run/walk for FREE. Make a team or come on your own, come schlep with us!